Guinea pigs are skittish little pets. Even if you interact with your cavy several times each day, sometimes when you try to pick up your furry friend, it will dart away as if you’re a new threat. I find it highly entertaining when Princess Piggy Poo screams as I try to get her out of her cage. She sounds like a screen siren in a slasher flick. Psycho comes to mind. Most often, she sits like a white furry lump eager for me to lift her out of her castle, but the times she screams are so unexpected and melodramatic I have to wonder what she’s thinking. I’ve noticed Princess Piggy Poo enjoys time outside of her hiding house munching on hay at the opposite end of her cage. However, when she perceives any movement or hears a new noise, she darts back into her hiding house. It’s as if she’s entering a magic fortress with an invisible force field that no one can penetrate. I used to scoff at this silliness but I realized I’m beginning to adopt some of Princess Piggy Poo’s jumpy behaviors. Working from home means no interruptions, so it’s easy to focus. However, I work by a window next to the front door, so anytime there is an unexpected noise or something catches my peripheral vision I startle — like a little guinea pig. Empathy can go a long way, but if I start screaming as I walk out the front door, somebody arrange an intervention. 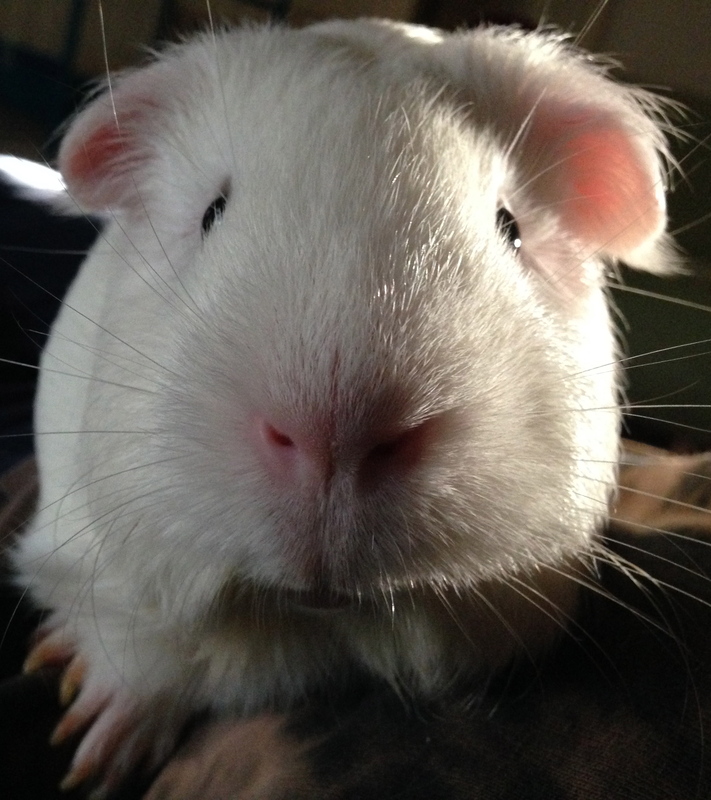 This entry was posted in Uncategorized and tagged cavy, guinea pig, hay, hiding house, pet, princess piggy poo. Bookmark the permalink.